Baton Rouge, Louisiana, and Tempe, Arizona: 2001. Edition of 125. 5 x 7" closed; 10 x 14" open. 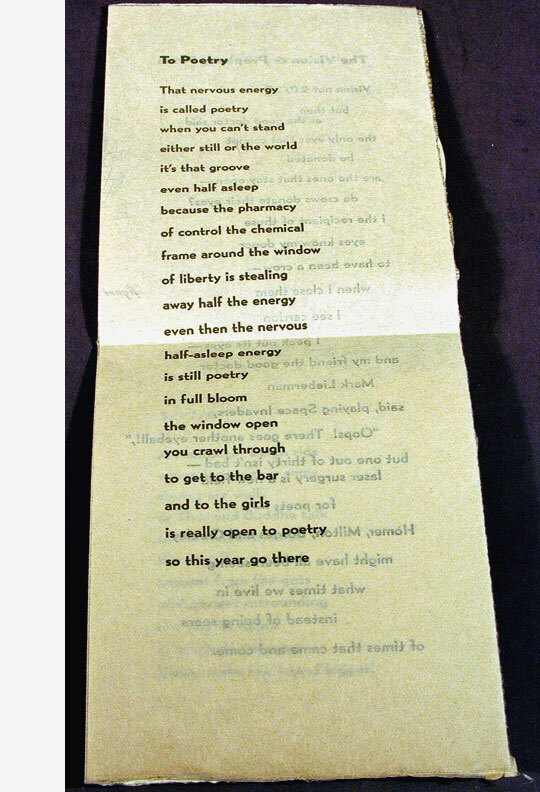 The text is digitally composed in Bernhard Gothic types and letterpress printed from hand processed photopolymer plates. Other letterpress printing came from found and unfound objects. The papers: Rives Heavyweight buff and Kitakata, a Japanese handmade paper. Features a movable text title page with a 1/4" diameter random text window. Printed in 9 runs on a Vandercook using polymer plates, handset type, and other relief surfaces. A collaborative artist's book designed, printed, and bound by Dan Mayer while in residence at the LSU printmaking studios. 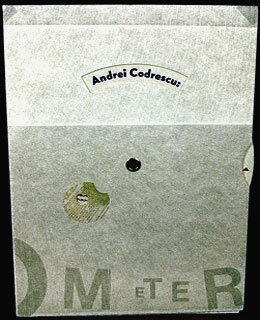 Contains new poems by NPR commentator Andrei Codrescu, who also teaches at LSU. This project coincided with Andrei Codrescu's keynote address for the Southern Graphics Council's 30th meeting in 2002. 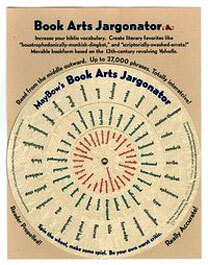 A continuing series of MayBow's Jargonators based on 13th-century revolving bookforms known as Volvelles, which were used to chart the position of stars and planets. 8.5 x 11" with three concentric wheels. Offset printed. Background image is Article II, Section I of the United States Constitution, which outlines the method of selecting a President. Construction based on 13th-century revolving bookforms knows as 'Volvelles,' used to chart the position of stars and planets. Also available in a letterpress edition. 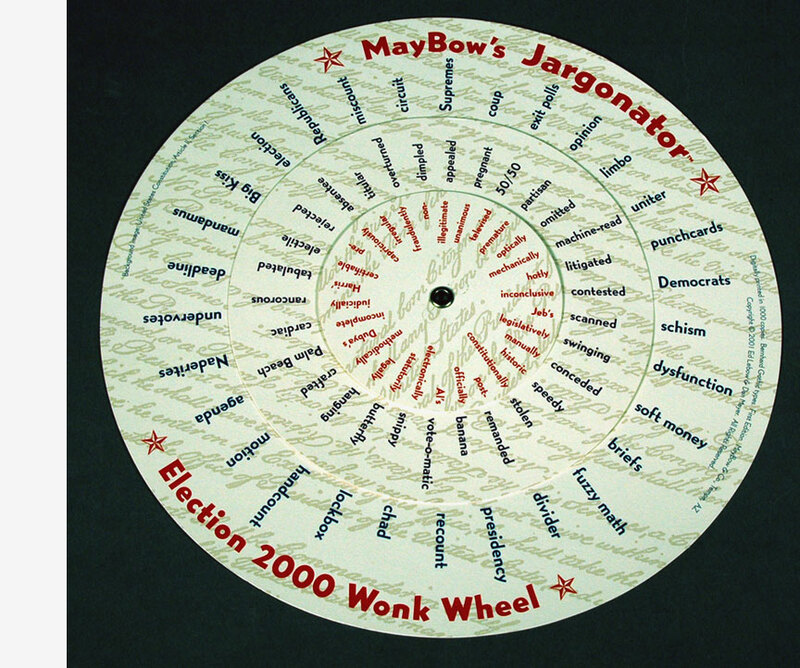 MayBow's "Election 2000 Wonk Wheel" is the ultimate tool for political junkies searching for the final word on Florida's Presidential vote. 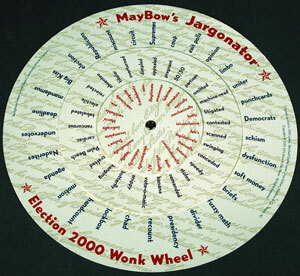 "The Jargonator's" three concentric wheels, each containing 30 words, spin up to 27,000 phrases – an arsenal in the ongoing war of words about the now historic citrus classic. Words were picked from headlines, editorials, and jokes about the campaign and Florida recount. Second in a continuing series of MayBow's Jargonators. Tempe, Arizona: 2000. Edition of 500. 8.5 x 11" single sheet with moveable text volvelle. Background image of a Phaistos disc, a 17th-century BCE Cretan clay disc containing pictographic symbols (discovered in 1908). Letterpress printed from photopolymer plates using a Vandercook Universal III press. Hand-cut and assembled using the time-honored eyelet binding system. 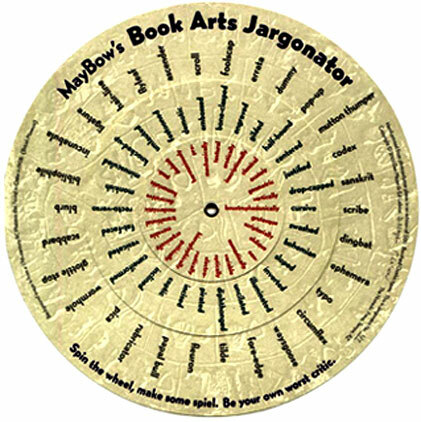 "The Book [Arts] Jargonator's dura-spin format generates useful and sonorous phrases like 'grotesque swashed dingbat,' 'monatically illuminated Wayzgoose' and the always pleasing 'boustrophedonically cursive scribe.' ... MayBow's experienced team of lexicographers have not been able to crack the Phaistos' code, so they've printed more words on top for future historians to unravel."